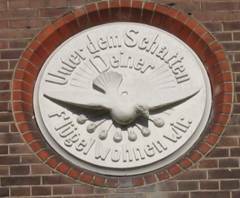 Over the portal of the Motherhouse of the Holy Spirit Adoration Sisters in the town of Steyl, Holland is a plaque depicting the Holy Spirit in the form of a dove and the words: In the shadow of your wings we dwell. The history of the Motherhouse has confirmed this confident note set by its foundress, Mother Mary Michael. 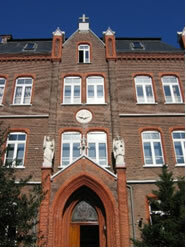 After the death of St. Arnold Janssen, founder of the Congregation, in 1909, Mother Mary Michael’s first major task was the erection of a Motherhouse. 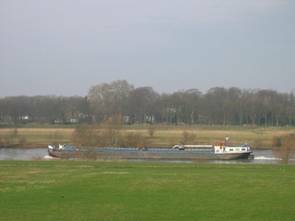 On the banks of the Maas river, a suitable place was found. The Divine Word priests and brothers drew up the plans and carried out the building, even to executing the beautiful stained glass windows that adorn the gothic chapel. The cornerstone, taken from the Catacomb of St. Agnes in Rome, was laid on December 9, 1912. On August 26, 1914 the motherhouse was blessed. The Sisters of the community walked in procession past the tomb of their venerated Founder to move into the new convent. The peaceful stillness was interrupted by an occasional cannon roar in distant Flanders, but the dove of peace hovered over the Netherlands during World War I. Thirty years later, the sound of cannons was again heard, but this time at its own doorstep. During World War II the Motherhouse was in grave danger, located as it was between the American-British forces on one side and the German army on the other. Sacred vessels and vestments were hidden, and the community sought shelter and safety in the convent basement, where they continued their common life for a hundred days. In a sub-basement room, they kept their most precious treasure, the Blessed Sacrament, and here held the liturgy and continued perpetual adoration. The floors above were opened to some members of the nearby SVD mission seminary, some Dominican Brothers and Sisters, and people of the neighborhood, whom the war had made homeless, and for a time, also to some military. Despite the seriousness and deprivations of the times, cheerfulness and confidence in the Holy Spirit’s protecting wings prevailed. Finally on March 1, 1945 the area was liberated by American troops. Since then, the normal, quiet contemplative life of the Sisters and the perpetual adoration of the Blessed Sacrament have continued as their contribution to the Church’s mission.